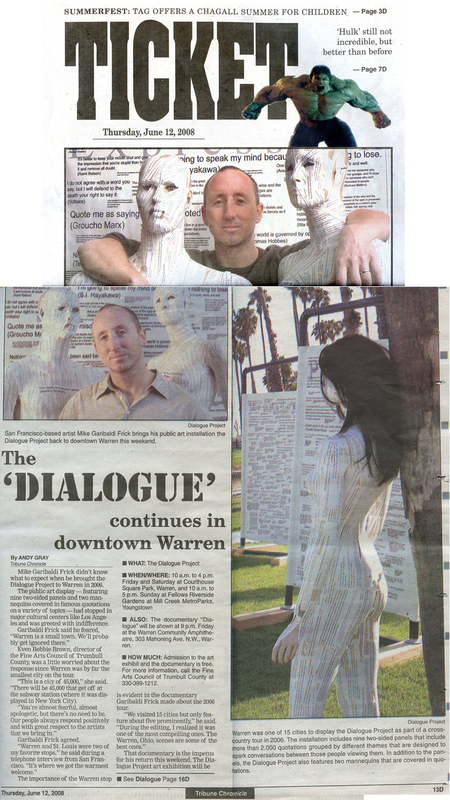 Dialogue Public Art Project: Inspirational Quotations: Warren"
Sally and I just returned from doing the Dialogue Project installation and screening the documentary in Warren and Youngstown, OH over the last 4 days. As many of you know, we visited Warren, OH during our 2006 tour and had a wonderful, warm welcome there which is featured in the documentary. This trip was no different. We flew into Cleveland on Thursday night and ate a fantastic dinner before driving down to Warren. After finally getting to sleep around 3am, we woke up at an hour later (4am) to do in-studio TV interviews in both Warren and Youngstown. I'm not really sure what I said, but the newscasters said I was cognizant... good! . 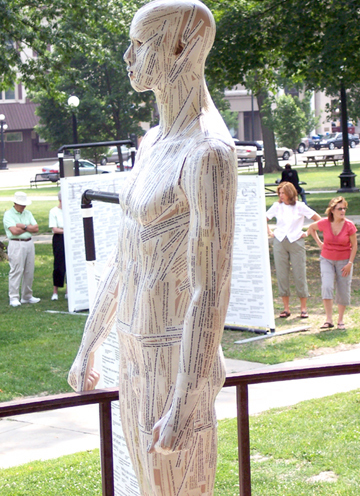 Although our sponsor --- Bobbie Brown of the Fine Arts Council of Trumbull County --- suggested I could talk less about the "naked mannequins" and more about the upcoming documentary screenings . Peggy --- one of the news anchors that interviewed us --- became a great friend over the following days; bringing us food, helping set-up, etc. She has teenage son who is an artist and the project really resonated with them. Peggy is looking into broadcasting the documentary on their local PBS stations. Cool! 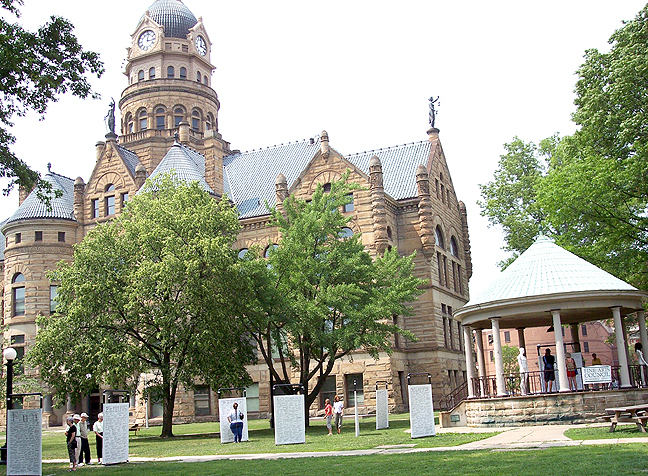 After our media interviews, we drove back to Warren and set up the project in their Courthouse Square -- the exact location we set up in 2006. We basically had the same weather experience... the first day was warm, muggy and raining and the second day (Saturday) was sunny and warm. 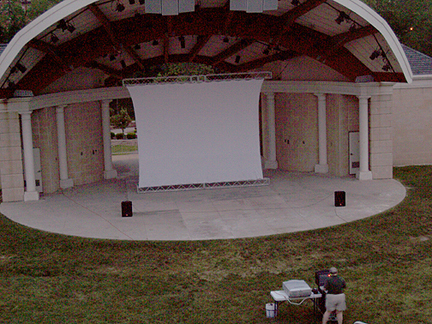 We planned on holding the documentary screening in their new beautiful 5,000 seat outdoor Amphitheater on Saturday night. Around 300-400 people showed up and we were very excited to watch the documentary with our biggest audience yet! The weather was beautiful up until the start of the documentary at 9pm. At almost 9pm on the dot, a dramatic, intense thunderstorm front started to move into the area. Bobbie Brown (our sponsor) shouted to the audience: "you have just enough time to RUN to your cars!" So, we all scattered as the lightning started to strike and the hail started to fall! We were told by other residents running for cover that this was tornado weather... and just then, the tornado sirens started going off --- "get back to your hotel and into the bathtub!" Sixty mile an hour winds suddenly buffeted us from all sides. Sally was screaming and running through the streets of Warren towards our hotel. Sally has a hip replacement and was a bit hobbled running... was the weakest one in our pack going to be sucked up into the tornado? Ummm, I digress . We survived. 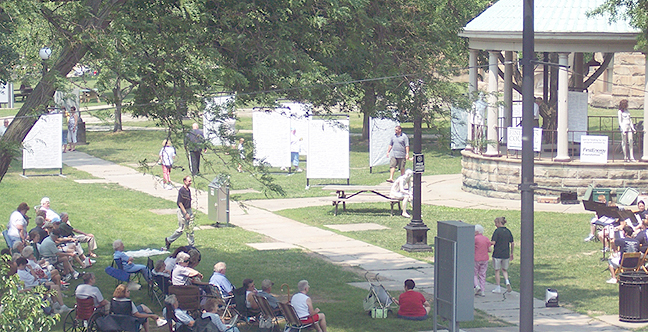 The next day, Sunday, we drove the project over to Youngstown and set it up on Father's Day in a beautiful public garden. Hundred's of people came through the project that day and we met some amazing people. It was one of the most naturally beautiful locations Dialogue has visited. Youngstown is going to have more documentary screenings during the year at their museums. 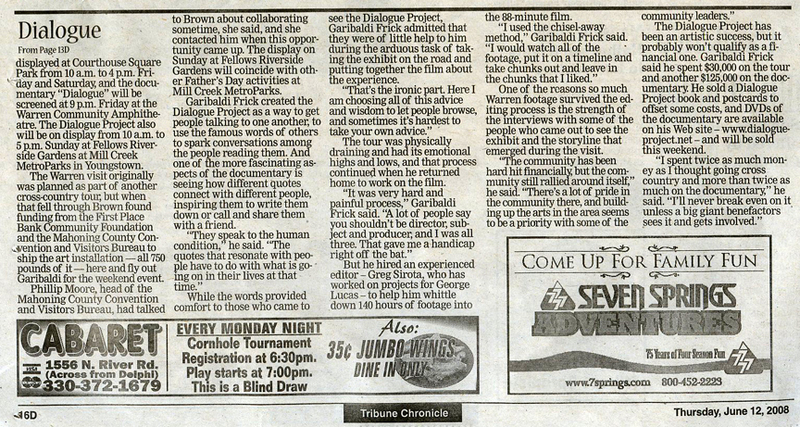 We were able to reschedule the documentary for that night. This time the weather was perfect. . I've seen the documentary in smaller film festival venues, but nothing compared to this huge screen and amazing sound system. Not as many people attended since we were not able to get the word out as well, but we still had a good crowd and all the people who are featured from Warren showed up to watch the movie. Needless to say, the audience burst into thunderous applause after the Warren scene. I packed up the Dialogue Project into a giant crate for shipping it home last night. Sally and I flew back this morning and plan to sleep for a week! We love our ongoing connection with Warren (and now Youngstown) and marvel over how Dialogue is introducing us to wonderful people and places we would never have known otherwise. You can also browse quotations that viewers submitted to us during our installations in Warren on the "Quotes by Subject" pages.